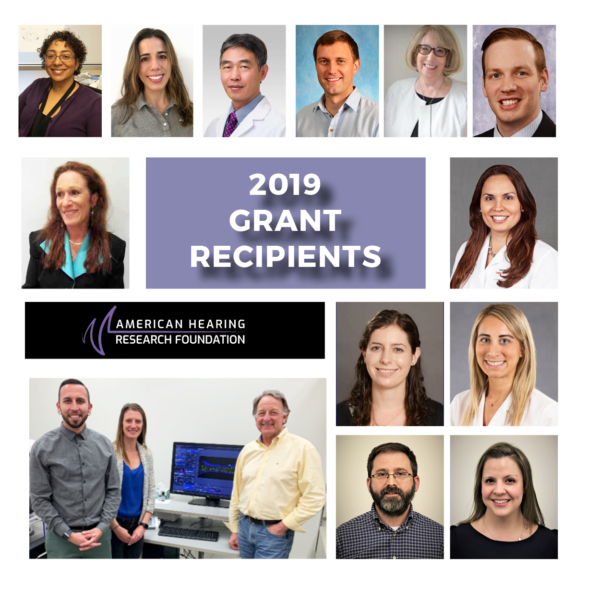 Elmhurst, Illinois – February 7, 2019 – The American Hearing Research Foundation (AHRF) announced that in January 2019, it awarded ten grants to investigators who are exploring hearing and balance disorders of the inner ear. AHRF awarded over $250,000 in grant monies in 2019. Seven grants of $20,000 to $50,000 were awarded, plus three grants of approximately $1,000 each for otolaryngology residents. Recipients will explore diverse topics, including ways to deliver hearing-protective drugs to those receiving cancer treatments, gene therapy approaches for inherited hearing loss, sound processing problems associated with autism, and how noise exposure causes changes in a specific region of the brain. In 2019, three otolaryngology residents received a Bernard & Lottie Drazin Resident Grant. AHRF offers this grant program to encourage individuals who might pursue a career in hearing and balance research. Each year AHRF offers up to five $1,000 awards to otolaryngology residents at specific institutions. Residents in their third year of otolaryngology programs are required to conduct basic science or clinical research projects. AHRF is a nonprofit organization that has been making new discoveries possible for more than 60 years by funding novel research to better understand and overcome hearing and balance disorders of the inner ear. Since 2010, the organization has funded 76 projects with more than $1.6 million in research grants.